Petruro Irpino is an Italian municipality in the province of Avellino in Campania, which is claiming to be an efficient model of integration. In this small village, situated between the green hills of Avellino, people of different religions and coming from different parts in the world peaceful live together. There are Nigerians, Pakistanis, Afghans, Ghanaians, Salvadorans. 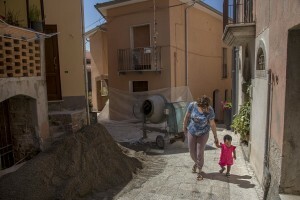 The inhabitants of the village during the day take care of the children of immigrants if their parents are engaged in Italian courses or other activities. In the evening, open-air dinners are organized where everyone feels brothers beyond the color of the skin or the country of origin. Recently also Pope Francis has written a letter to congratulate those who are committed in carrying on this reality. The main idea is that smaller municipalities become the focus of epochal change in which small groups of migrants can give life to countries that are likely to become abandoned. Pasqualina D’ Aria, reception operator of Petruro Irpino Sprar (Protection systems for asylum seekers and refugees) takes care of Testimony Erahbor from Nigeria while her mother participates in an Italian language course in Petruro Irpino, southern Italy on June 14, 2017. Petruro Irpino is an Italian small village with 367 inhabitants in the province of Avellino in Campania, which is claiming to be an efficient model of integration and where people of different religions and coming from different parts in the world peaceful live together. 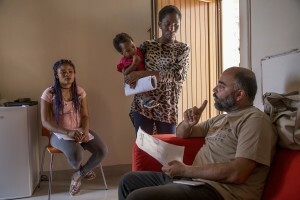 Marco Milano, coordinator of Petruro Irpino Sprar (Protection systems for asylum seekers and refugees) speaks with some migrants inside the headquarters of the Sprar in Petruro Irpino, southern Italy on June 14, 2017. Petruro Irpino is an Italian small village with 367 inhabitants in the province of Avellino in Campania, which is claiming to be an efficient model of integration and where people of different religions and coming from different parts in the world peaceful live together. Yaya Darboo from Gambia and Abdirahman Mamud from Somalia play table football inside the headquarter of Chianche Sprar (Protection systems for asylum seekers and refugees) near Petruro Irpino, southern Italy on June 14, 2017. Petruro Irpino is an Italian small village with 367 inhabitants in the province of Avellino in Campania, which is claiming to be an efficient model of integration and where people of different religions and coming from different parts in the world peaceful live together. Evelyn Ugbodaga from Nigeria and beneficiary of the protection systems for asylum seekers and refugees, is portrayed in the house where she lives in Chianche, near Petruro Irpino, souther Italy on June 14, 2017. Petruro Irpino is an Italian small village with 367 inhabitants in the province of Avellino in Campania, which is claiming to be an efficient model of integration and where people of different religions and coming from different parts in the world peaceful live together. A general view of Petruro Irpino, southern Italy on June 14, 2017. Petruro Irpino is an Italian small village with 367 inhabitants in the province of Avellino in Campania, which is claiming to be an efficient model of integration and where people of different religions and coming from different parts in the world peaceful live together. Angel Buendia from El Salvador and beneficiary of the protection systems for asylum seekers and refugees is seen in the house where he lives with his sons Miguel and Marcela in Petruro Irpino, southern Italy on June 14, 2017. Angel in his country was a policeman but had to run away with his family after he was threatened with death for having found information about drug trafficking. Petruro Irpino is an Italian small village with 367 inhabitants in the province of Avellino in Campania, which is claiming to be an efficient model of integration and where people of different religions and coming from different parts in the world peaceful live together. Assunta Tropeano, operator of Petruro Irpino Sprar (Protection systems for asylum seekers and refugees) holds a course of Italian language for migrants inside the headquarter of the Sprar (Protection systems for asylum seekers and refugees) in Petruro Irpino, southern Italy, on June 14, 2017. Petruro Irpino is an Italian small village with 367 inhabitants in the province of Avellino in Campania, which is claiming to be an efficient model of integration and where people of different religions and coming from different parts in the world peaceful live together. 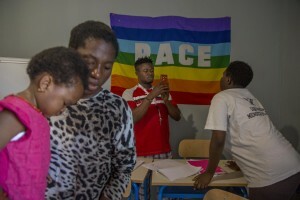 Migrants are seen after the course of Italian language inside the headquarter of the Sprar (Protection systems for asylum seekers and refugees) in Petruro Irpino, southern Italy, on June 14, 2017. Petruro Irpino is an Italian small village with 367 inhabitants in the province of Avellino in Campania, which is claiming to be an efficient model of integration and where people of different religions and coming from different parts in the world peaceful live together. A local greets Pasqualina D’ Aria, reception operator of Petruro Irpino Sprar (Protection systems for asylum seekers and refugees) taking care of Testimony Erahbor from Nigeria while her mother participates in an Italian language course in Petruro Irpino, southern Italy on June 14, 2017. Petruro Irpino is an Italian small village with 367 inhabitants in the province of Avellino in Campania, which is claiming to be an efficient model of integration and where people of different religions and coming from different parts in the world peaceful live together. Ali Hassan from Pakistan plays gymnastics inside the headquarter of Chianche Sprar (Protection systems for asylum seekers and refugees) near Petruro Irpino, southern Italy on June 14, 2017. Petruro Irpino is an Italian small village with 367 inhabitants in the province of Avellino in Campania, which is claiming to be an efficient model of integration and where people of different religions and coming from different parts in the world peaceful live together. Vivian Uyi from Nigeria and beneficiary of the protection systems for asylum seekers and refugees, is portrayed with Anna Serenelli psychologist of Chianche sprar in her house in Chianche, near Petruro Irpino, souther Italy on June 14, 2017. Petruro Irpino is an Italian small village with 367 inhabitants in the province of Avellino in Campania, which is claiming to be an efficient model of integration and where people of different religions and coming from different parts in the world peaceful live together. Marco Milano, coordinator of Petruro Irpino Sprar (Protection systems for asylum seekers and refugees) helps Leiva Marcela Bonifacio from El Savador to prepare her third-rate exam in Petruro Irpino, southern Italy on June 14, 2017. Petruro Irpino is an Italian small village with 367 inhabitants in the province of Avellino in Campania, which is claiming to be an efficient model of integration and where people of different religions and coming from different parts in the world peaceful live together. Alima Ibrahim from Nigeria and beneficiary of the protection systems for asylum seekers and refugees is seen with her daughter Mariella in the house where she lives in Petruro Irpino, southern Italy on June 14, 2017. Petruro Irpino is an Italian small village with 367 inhabitants in the province of Avellino in Campania, which is claiming to be an efficient model of integration and where people of different religions and coming from different parts in the world peaceful live together. 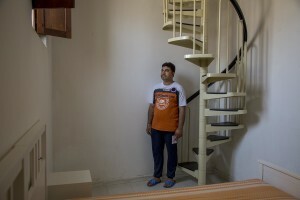 Rajuir Sing from Afghanistan and beneficiary of the protection systems for asylum seekers and refugees, is portrayed in the house where he lives in Petruro Irpino, southern Italy on June 14, 2017. Petruro Irpino is an Italian small village with 367 inhabitants in the province of Avellino in Campania, which is claiming to be an efficient model of integration and where people of different religions and coming from different parts in the world peaceful live together. Anastas Issa, Christian from Palestine and Ali Hassan, Muslim from Pakistan and beneficiaries of the protection systems for asylum seekers and refugees, are seen in the kitchen of the house where they live in Chianche, near Petruro Irpino, southern Italy on June 14, 2017. Petruro Irpino is an Italian small village with 367 inhabitants in the province of Avellino in Campania, which is claiming to be an efficient model of integration and where people of different religions and coming from different parts in the world peaceful live together. 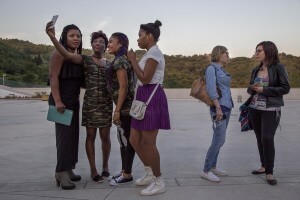 Vivian, Pamela Favour and Precious from Nigeria and beneficiaries of the protection systems for asylum seekers and refugees take a selfie in the square of Petruro Irpino, southern Italy on June 14, 2017. Petruro Irpino is an Italian small village with 367 inhabitants in the province of Avellino in Campania, which is claiming to be an efficient model of integration and where people of different religions and coming from different parts in the world peaceful live together. 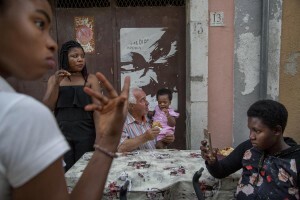 Vivian Uyi from Nigeria and beneficiary of the protection systems for asylum seekers and refugees, is portrayed in the house where she lives in Chianche, near Petruro Irpino, souther Italy on June 14, 2017. Petruro Irpino is an Italian small village with 367 inhabitants in the province of Avellino in Campania, which is claiming to be an efficient model of integration and where people of different religions and coming from different parts in the world peaceful live together. 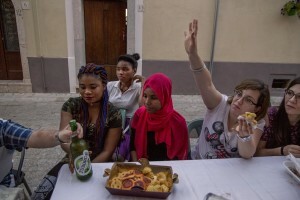 Locals and beneficiaries of the protection systems for asylum seekers and refugees are seen during a dinner organized in the center of Petruro Irpino, southern Italy on June 14, 2017. Petruro Irpino is an Italian small village with 367 inhabitants in the province of Avellino in Campania, which is claiming to be an efficient model of integration and where people of different religions and coming from different parts in the world peaceful live together. Children play inside the house of Rajuir Sing, an Afghan man and beneficiary of the protection systems for asylum seekers and refugees in Petruro Irpino, southern Italy, on June 14, 2017. Petruro Irpino is an Italian small village with 367 inhabitants in the province of Avellino in Campania, which is claiming to be an efficient model of integration and where people of different religions and coming from different parts in the world peaceful live together. People are seen in the street of Petruro Irpino, southern Italy on June 14, 2017. Petruro Irpino is an Italian small village with 367 inhabitants in the province of Avellino in Campania, which is claiming to be an efficient model of integration and where people of different religions and coming from different parts in the world peaceful live together. Abdirahman Mamud from Somalia is seen inside the headquarter of Chianche Sprar (Protection systems for asylum seekers and refugees) near Petruro Irpino, southern Italy on June 14, 2017. 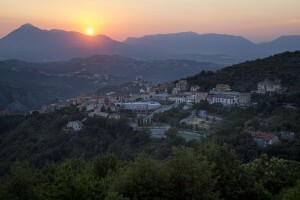 Petruro Irpino is an Italian small village with 367 inhabitants in the province of Avellino in Campania, which is claiming to be an efficient model of integration and where people of different religions and coming from different parts in the world peaceful live together.